You just gotta love history and archaeology and all excitement that come with them. In this article, we take a look at some of the most incredible ancient monuments and ruins left behind by people thousands of years ago. From the Pyramids to underwater monuments, we take a look at the most incredible, breathtaking and mysterious monuments ever erected by mankind in the distant past. This archaeological site is located in Peru and is significant because it is the place where researchers believe, the ancient Inca worshipped water. Mostly unknown to all of us, the most important monument found at the Sayhuite site is the Sayhuite monolith, a fascinating sculpture featuring over 200 mysterious geometric figures, with zoomorphic depictions of reptiles, frogs and felines among others. 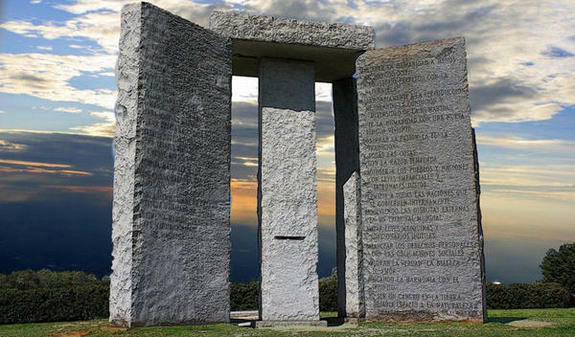 The true origin and purpose of this incredible monument is still widely debated among researchers around the world. Most archaeologists suggest that this ancient monument was sculpted and intended to represent a topographical hydraulic model, continuing terraces, ponds, rivers, irrigation channels hills and tunnels. Located near the Sayhuite archaeological site are many incredible stone features that could predate the Inca themselves, and made from Andesite stone, meaning that they simply couldn’t be shaped with tools the Ancient Inca possessed at that time, casting doubt on the origins of the entire Sayhuite archaeological site and the Sayhuite monolith. The Goseck circle is surely one of the lesser known monuments found in Europe. Resembling Stonehenge in England, the odd circular formations were actually spotted recently, in 1991, during an aerial survey near the small town of Goseck in Germany. The mysterious monuments are believed to date back to 4,900 BC and is believed to have been created by Europe’s first and most mysterious early civilization, which existed even before the Minoan Civilizations and Ancient Egyptian Pyramids. In 2002, archaeologists performed excavations and found the remains of an extremely ancient structure that were reconstructed in the past. According to studies, the monument stretching 75 meters in width was composed of a set of concentric ditches and two palisade rings and a set of gates that were accurately aligned with the sunrise and sunset on solstice days. This has led researchers to theorize that the ancient monument might have been sued by ancient man as a solar or lunar calendar. Many researchers consider the Goseck Circle as the oldest known solar observatory in the world. The Nebra Sky Disk – one of the most important finds if the 20th century according to many— was discovered near the Goseck circles. The Nebra sky disk is believed to be the oldest known realistic representation of the cosmos found on our planet. Located near the border with Syria in southern Turkey are the ruins of one of the most incredible monuments created my our ancestors. The megalithic stone circles are believed to be the oldest temple ever created on our planet and predate Stonehenge in England by several thousand years. 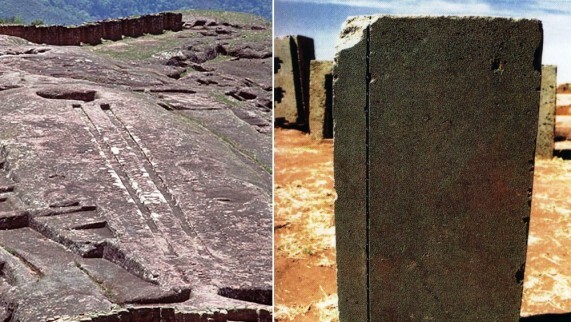 Researchers believe that t these ancient megalithic ruins were created by hunter-gatherer society, something that is being ruled out by more archaeologists lately. The mysterious temple, which consists of three huge stone circles was deliberately buried for an unknown reason in the distant past. After 13 years of digging, archaeologists investigating the ancient site have failed to recover a single stone-cutting tool. They found any agricultural implements. So how can you create these 19-foot-tall, perfectly sculpted columns that are 11,000 to 12,000 years old, and not find any evidence what so ever of tools user to accomplish this? It seems that Puma Punku is everywhere, or at least on Ancient Code. We cannot help and include Puma Punku in our list of most incredible ancient monuments. The temple complex of Puma Punku is found near Tiwanaku Bolivia, and the two are a pair of the most mysterious structures ever erected on Earth. It is considered by many people as having an otherworldly origin, while many other attribute its ingenuity to advanced ancient societies that inhabited Earth in the distant past. But what we can say for sure is that these monuments are, without a doubt, the most incredible ancient ruins found in South America. The incredible megalithic stones that have been found both at Tiwanaku and Puma Punku display incredible precision cuts and are believed to be evidence of advanced ancient engineering, which in turn resulted in some of the most incredible structures discovered in the Americas, structures that incorporate a high level of geometry and mathematics, even though the people who are believed to be the builders did not know about the wheel, nor did they possess a writing system. We don’t need to travel to far from Bolivia to reach our next destination. Located in Peru, at an elevation of 2,430 meters above sea level we find Machu Picchu, a 15-century Inca City situated on a mountain ridge above the so-called Sacred Valley. This ancient site extends over an amazing 5-mile separation, emphasizing more than 3,000 stone steps that connect the different levels of this mysterious ancient site. Archaeologists have been baffled by the fact that most of the junctions in the central city are so perfect that not even a blade of grass can fit between the stones. 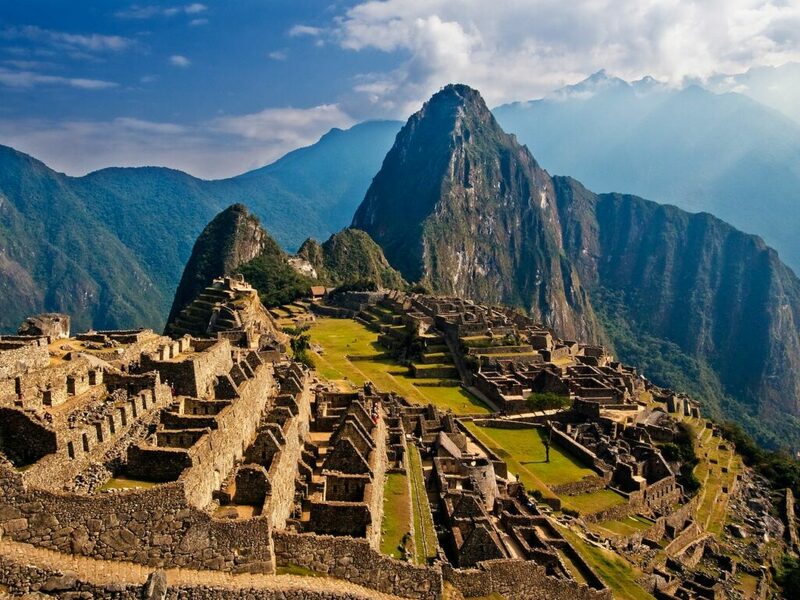 The biggest mystery at Machu Picchu is without a doubt the “Intihuatana”. This giant rock situated on a raised platform that towers above the main plaza were believed to be a sundial. However, recent studies have disproved this theory shedding more mystery on this incredible ancient site. Some believe that “the Intihuatana” may have been used for astronomical observations, or even might have been connected with the mountains that shelter Machu Picchu. But the “Intihuatana” isn’t the only mystery at Machu Picchu. Located in the southwestern part of the main plaza is the Temple of the Three Windows, one of Machu Picchu best-known features. The stone hall which spreads 35 feet in length and 14 feet in width contains three trapezoidal windows along one of its walls, something considered as a rare feature in Inca masonry. However, this feature can be found in numerous monuments around the world, and many hints towards a mysterious connection pointing towards what we like to call “Sacred Architecture”. The ancient metropolis of Teotihuacan was established around 100 BC and was considered as one of the most important ancient centers in the New World until its fall somewhere around the seventh or eighth centuries. According to archaeologists the advanced design of Teotihuacan suggests that ancient builders had knowledge, not only of architecture but of complex mathematical and astronomical sciences, and one of the things that are just incredibly amazing and different from all other ancient sites is the fact that from the air, Teotihuacan‘s city layout strangely resembles a computer circuit board with two large processor chips— the Sun Pyramid and the Moon Pyramid. Researchers have also found numerous and remarkable similarities to the Great Pyramids of Egypt. The Pyramid of the Sun is exactly half as tall as the Pyramid of Giza and the Temple of the Sun, the Temple of the Moon, and the Temple of Quetzalcoatl are in the same layout as Orion’s Belt. The most impressive monuments and pyramids ever built in the New World are located in Teotihuacan. The name “Teotihuacan” is translated into “Birthplace of the Gods” or “Where Gods Were Born”, and no one knows built one of the most advanced ancient cities in Pre-Colombian America. The city was found in ruins by the Ancient Aztecs who gave it its present name. Ok, so the Georgia Guidestones aren’t that ancient but still, they are fascinating. Referred to by many as an “American Stonehenge”, the Georgia Guidestones is a granite monument in Elbert County, Georgia with carved inscriptions in four ancient languages: cuneiform Babylonian, Classical Greek, Sanskrit and Egyptian hieroglyphs. The author of these plates is so far unknown and the significance of the inscriptions is a matter of debate among experts and amateurs who cannot agree on the matter. The four outer stones are oriented to mark the limits of the 18.6 year lunar declination cycle. The center column features a hole drilled at an angle from one side to the other, through which can be seen the North Star, a star whose position changes only very gradually over time. The most widely agreed-upon interpretation of the stones is that they describe the basic concepts required to rebuild a devastated civilization. Easter Island is located in the southern Pacific Ocean and features some of the most mysterious statues ever created by mankind. 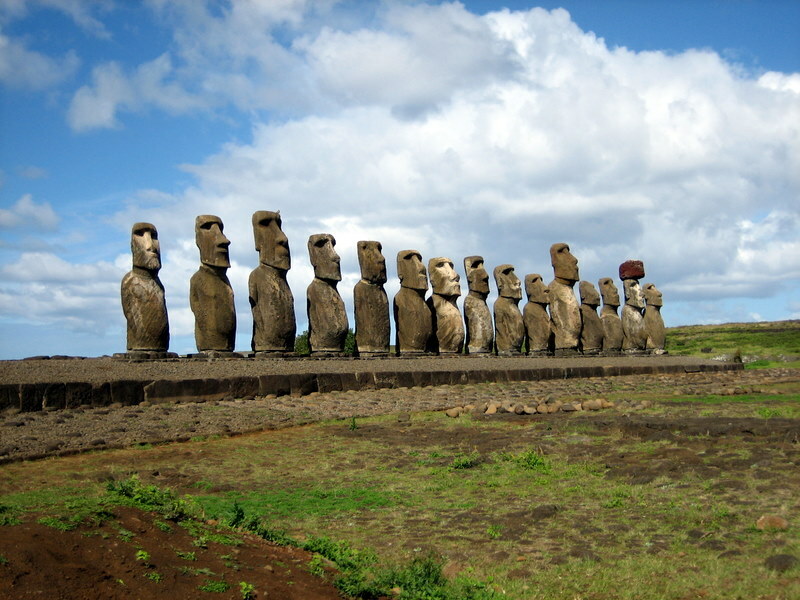 The famous statues were created by the local Rapanui people and are believed to have been part of an ancestral worship of the island’s settlers and were carved between 1250 and 1500 AD. According to researchers, the heaviest of the statues weighs a staggering 86 tons. While most of the statues are located in the vicinity of their quarries, some of them were moved and put into place at different locations on the island. The Moai statues remain as an enigma for both historians and archaeologists who have little information about them. Stonehenge is without a doubt one of the most famous ancient monuments on Earth. Archaeologists estimate it was built anywhere from 3000 BC to 2000 BC. Radiocarbon dating in 2008 suggested that the first stones were raised between 2400 and 2200 BC. New studies suggest that Stonehenge was located 225 kilometers from its current position, or better said, the stones used for its construction. According to a new study by archaeologists and geologists from the University College London (UCL), the stones of Stonehenge originated in the Preseli Hills, Pembrokeshire. Ancient people quarried the stones sometime between 3400 BC and 3200 BC, while the monument was constructed, according to mainstream scholars around 2900 BC, this means that the ancient monument could be in fact 500 years older than previously thought. 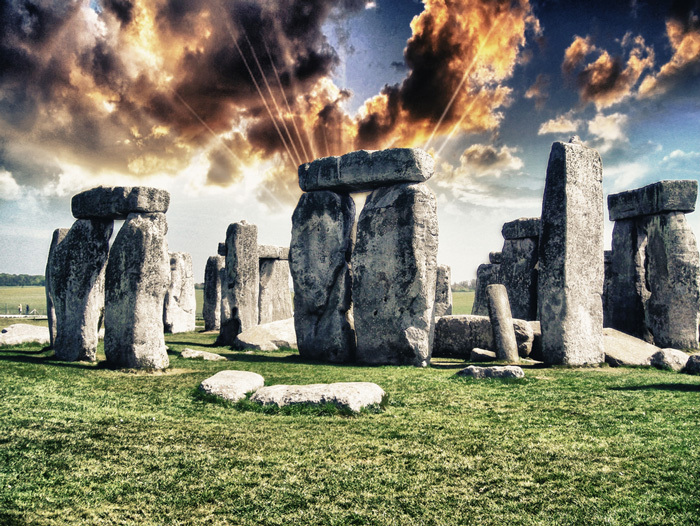 Researchers agree that the long-distance transport of the bluestones from Wales to Stonehenge is without a doubt, one of the most remarkable accomplishments of society thousands of years ago. The biggest of Stonehenge’s stones, known as sarsens, are up to 30 feet (9 meters) tall and weigh 25 tons (22.6 metric tons) on average. It is widely believed that they were brought from Marlborough Downs, a distance of 20 miles (32 kilometers) to the north. Many believed that Heraklion was just a myth as Atlantis. Heraklion was the Greek name of this ancient city, but for ancient Egyptians, the city was called Thonis. It was known to many ancient Greek philosophers, among them Herodotus, who referred to this ancient city in numerous of his writings, although the existence of this city wasn’t proven until the nineteenth century. Among the items found there were giant statues of the ancient Egyptian goddess Isis, Hapi and figures of a mysterious and unknown Egyptian Pharaoh, all of them were found in a surprisingly good condition. Hundreds of smaller statues were also discovered that once belonged to Cleopatra. Dozens of religious artifacts ere found that belonged to supreme gods of ancient Egypt such as Isis, Osiris and Horus. 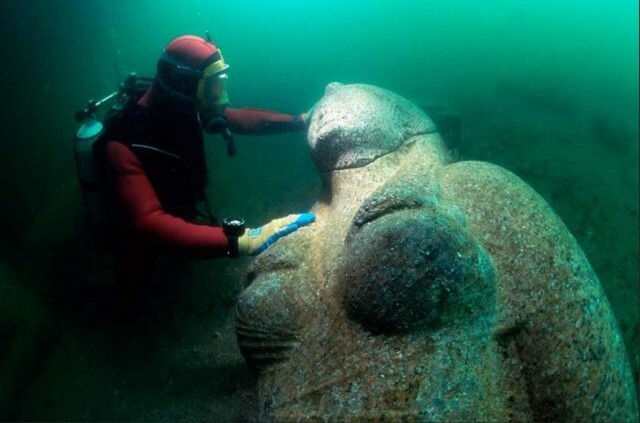 Underwater archaeologists also came across several sarcophagi with the mummified remains of animals sacrificed to Amun-Gereb, the supreme god of the Egyptians. 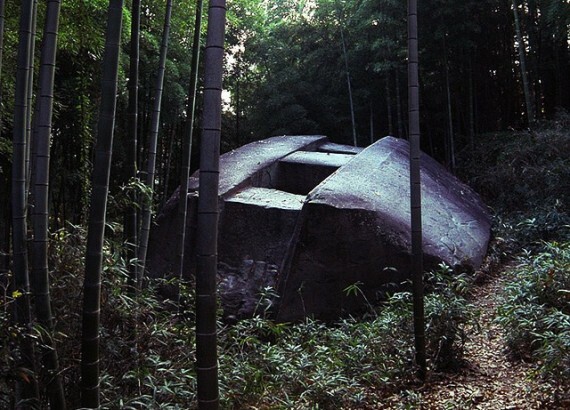 The Ancient Rock Ship of Asuka, Japan or the Masuda-no-Iwafune is another incredible ancient monument that has raised more questions than answers in recent years. The Rock ship of Masuda sits atop the steep incline of a hill located near the town of Asuka and its origin, purpose and meaning remain a mystery. It is the largest of the rock mounds found in the area with dimensions of 11 meters (36 feet) by 8 meters (26 feet), by 4.5 meters high (15 feet) and created out of SOLID GRANITE, meaning that this ancient Rock Ship weighs around one hundred tons. The mysterious monument has two holes each about a meters square in the center that continue through the ground. The truth is that so far, no one has been able to fully understand how ancient mankind created this monument and what its original purpose was. Experts note that the linear protrusion located at the top of the structure runs parallel to the top of the hill and strangely aligns with the sun on a day known as ‘spring doyou entry’ a date extremely important in the calendar for ancient Japanese agriculture as it marked the beginning of the agricultural season. Many researchers would agree that the Jungles of Guatemala and surrounding countries hide great secrets of mighty ancient civilizations that ruled the lands in the distant past. From ancient temples and mysterious civilizations, anything can be discovered in these mysterious jungles. 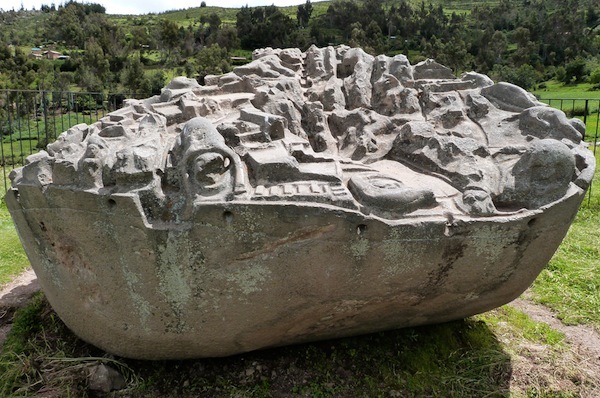 One of the most mysterious findings is surely the Giant Stone Head of Guatemala. 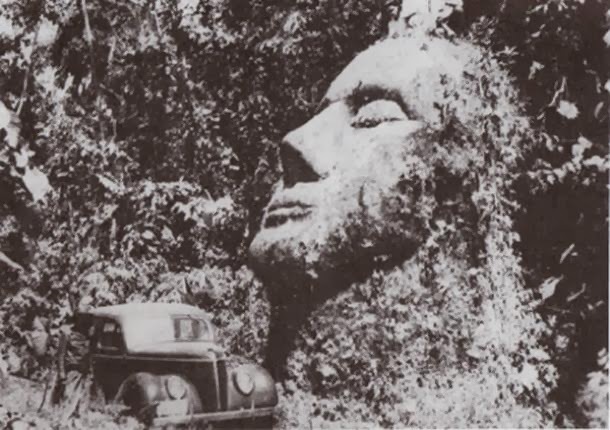 First reports about the mysterious stone head came in 1987 when Dr. Rafel Padilla received a photograph of the mysterious monument in the Guatemalan jungle. The image was taken sometime in 1950 by the owner of the land where the state had been found. To make things even more mysterious, we take a look at the features of the Giant Stone Head like thin lips, long nose, a face directed to the sky and a gigantic body suspected to hide underground. Researchers suggest that the facial features of the giant stone statue represent Caucasian features which are inconsistent with all of the known pre-Hispanic races of America. Regrettably before researchers managed to investigate this incredible statue, it was destroyed by rebel forces and militia, used as target practice.